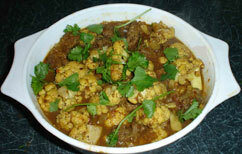 Gobhi Gosht is a beef and cauliflower curry which I usually make quite hot. Gosht is an Urdu word for 'meat' or 'flesh' and in Pakistan this would quite likely be made with beef. The Indian version of this would be mutton (usually goat mutton rather than lamb). This is very much a dish of Northern Indian, Pakistan and Bangladesh and is usually quite dry but very rich. 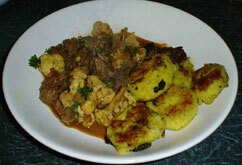 There are of many variants of this for instance using potato instead of (or even as well as) cauliflower, and this itself is a variant on the basic bhuna gosht. 1 teaspoon white poppy seeds. Beef. Use a solid meaty cut like chuck, skirt or rump. Chilli. In this quantity I use 1 green scotch bonnet, and this gives it quite a kick. You can of course use more or less to suite. You can make it milder by using milder chillis or, if you are using scotch bonnet, then by removing the seeds. Tomatoes. Use fresh plum tomatoes, peeled and chopped or tinned tomatoes are fine. Spices. There are some optional extras here if you wish. Cumin (especially black or shahi cumin) and black cardamom will both add a depth and earthiness to the dish. Oil. I use mustard oil for this dish. You can use ghee or ordinary vegetable oil. Cut the meat into quite big chunks - about 1inch (2.5cm). Peel the garlic and ginger. Mince the garlic and ginger together to form a paste. Stir this paste in with the meat. Heat a dry frying pan. Throw in the coriander, peppercorns, cinnamon, poppy seeds and cloves. Roast these spices for a minute or so then grind them. Heat the oil in a heavy bottomed saucepan. Fry the onions and chillis for a few minutes until the onions are soft. Put in the ground spices and the desiccated coconut, stir in and fry for another minute or so. Put in the meat with the garlic and ginger. Add the cauliflower and tomatoes then turn down the heat. Cover with water, put on a lid and simmer for about an hour stirring occasionally. Stir in a handful of coriander leaves and pour into a serving dish. You can chop the meat and/or the onions finer if that is what you like - I like my gobhi gosht to be a nice chunky stew type dish but its up to you. As an option you can grind the coconut along with the other spices. Gobhi Gosht is a good all in one meal. I usually have this with bread such as paratha (particularly the flaky option) but you can eat this with plain boiled rice as well and I recently had Aloo Tikki as a side dish with this. A nice mango chutney also goes very well.